Thanksgiving was a big deal in my house growing up, and very focused on tradition. Since my parents were both the only children in their families who lived far from the rest of their families, we generally didn’t have loads of extended family in town for major holidays. We sometimes had friends over, but more often than not, we celebrated holidays with just us- and therefore our food traditions became very embedded as part of the holidays themselves. I still remember the first Thanksgiving I spent with my husband on our own when we just had a little toddler and a baby. I recreated everything my family of 6 grew up on so religiously because I couldn’t possibly imagine anything different! I slaved for an entire day making every last dish, imagining my children’s sparkly eyes as they would gaze upon the table and have a perfect holiday to add to their forever memories of their childhoods. Well. We sat down at that fancy table, with enough food to feed an army, and my baby cried, my toddler picked at the funny chicken, and the entire thing was over in less than 10 minutes. It was anticlimactic to say the least. a.) You don’t want to. d.) The thought of doing the whole bird thing gives you panic attacks. Enter the roasted turkey breast. You can make it all year round. We’re talking about it today because it’s great for Thanksgiving, but it’s a terrific Sunday dinner, too, and works great to keep in the fridge for roasted turkey sandwiches during the week. You can find turkey breast in the meat department of the grocery store. It should be attached to the bone (and often the backbone, too) and looks like a giant chicken breast. I’ve written this recipe for 1 breast, about 3 pounds, but you can certainly do more than that at at time. 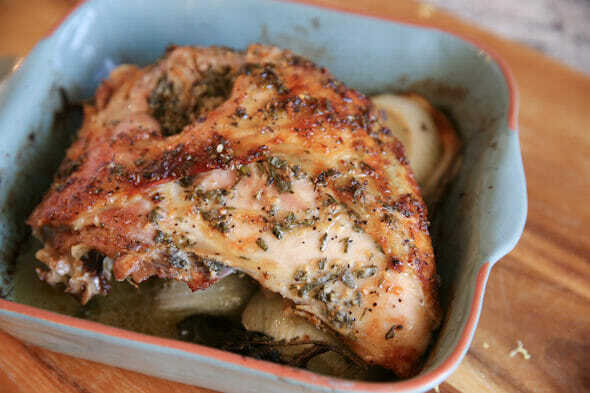 If you’re serving a crowd, you can fit 2 or more in a roasting pan and just double or triple the herb mixture. You don’t have to brine a turkey breast, but honestly, it makes a difference in the final product. Brined meat comes out juicier and more tender. Turkey breast only really needs an hour or so. To make a simple brine, just combine water and salt. You can adjust the amount so you have enough to cover the turkey. There are all sorts of fancy brines, and you can certainly use any of those, but since we’re putting so much flavor ON the actual meat, I’m just sticking with the easy basic brine mix of salt and water. 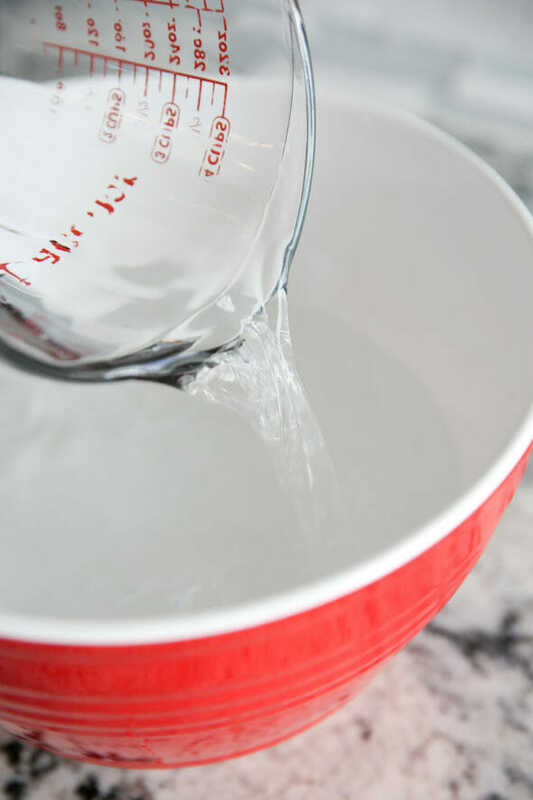 You can really make as much as you need, using the ratio of 1 tablespoon salt for every 1 cup of water. In the mean time, you can prepare the flavor we’re going to rub all over this thing. I use a combo of olive oil and butter, along with some lemon zest, garlic, and fresh herbs. 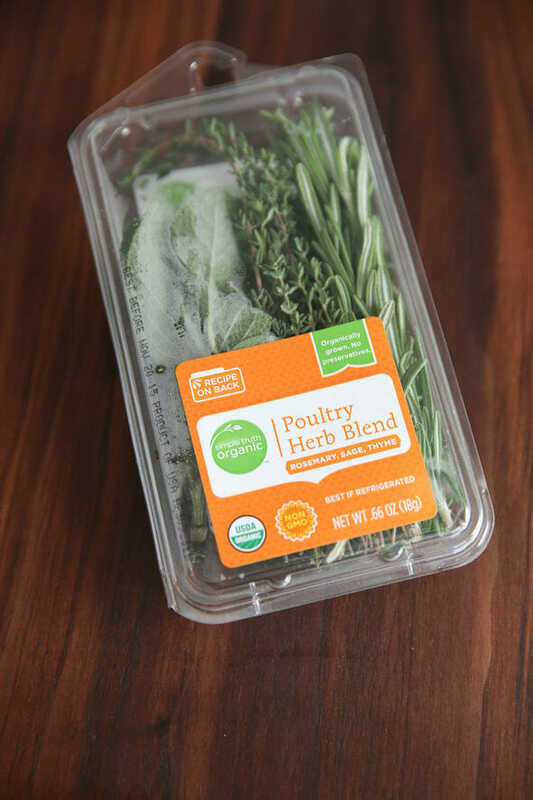 You can usually find these little packs of herbs in the produce section of the grocery store that have all 3 of the ones you need: rosemary, sage, and thyme. 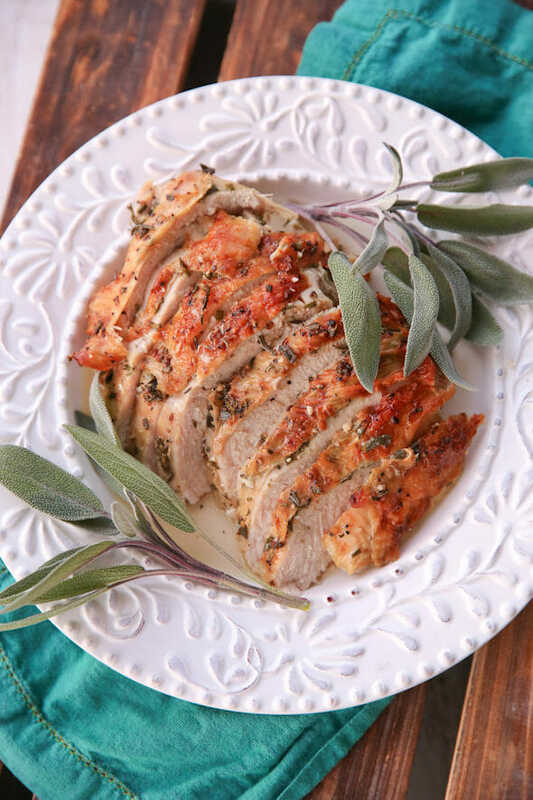 While your turkey is brining, you can mix up the herb rub. I use a combination of both butter and olive oil, along with some garlic, lemon zest, herbs, and salt and pepper. When you’re ready to go, you’ll mix this mixture up and then use your hands to spread it all over the meat. The most important part is separating that skin on top without actually tearing it off. You’ll want to stick your hand in there (yes, it feels as gross as it sounds, but it’s worth it, I promise!) and stuff the rub everywhere. If you have any leftover herbs, toss them in the pan as well. I usually sprinkle a little extra salt and pepper on top for good measure. You’ll roast it on high heat for a few minutes and then turn down the heat to finish cooking. Definitely use a digital thermometer to get the temperature right and don’t overcook it! I suggest basing a few times during the cooking process as well, to get that nice golden brown top. Let the meat sit for 5-10 minutes for the juiciest meat. Then carve it off the bone and slice it up. The juices and drippings are SO flavorful, so they are good on their own, just drizzled over the meat, or you can use them and follow this tutorial for some killer homemade gravy. Try this out for thanksgiving, or for a nice dinner at home during the week. And if you DO want to cook the whole dang bird, definitely check out our very popular Thanksgiving turkey recipe, right here. 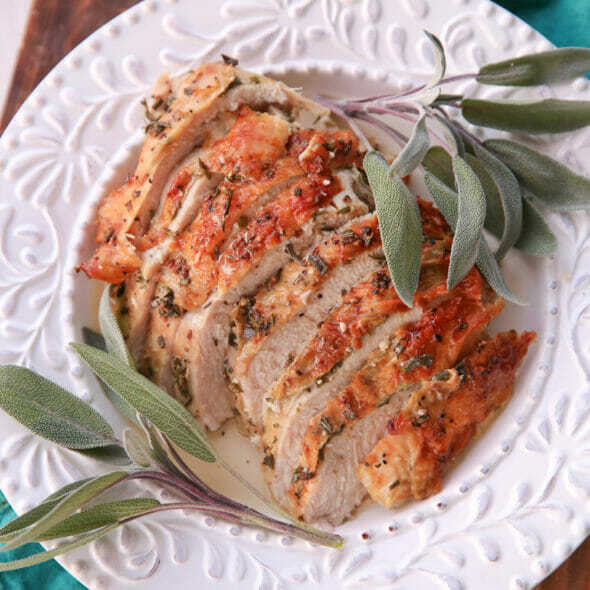 An easy oven-roasted turkey breast basted in classic herbs. Perfect for family dinner, or a holiday meal when you don’t need the whole bird! For the brine: Combine water and salt in a large bowl or roasting pan (you’ll want something deep enough to submerge turkey in water). 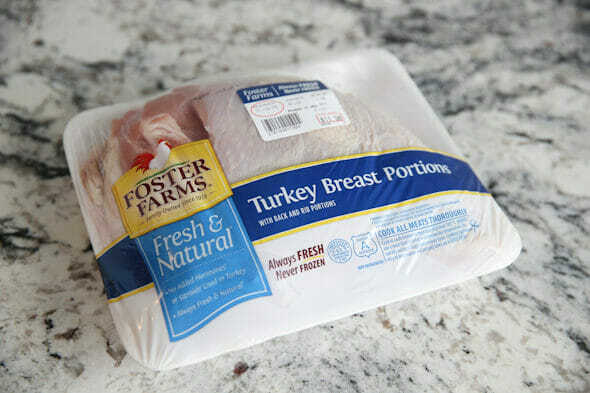 Place turkey breast in brine and let sit for at least 1 hour, and up to several hours. For the herb rub: Preheat oven to 425 degrees. 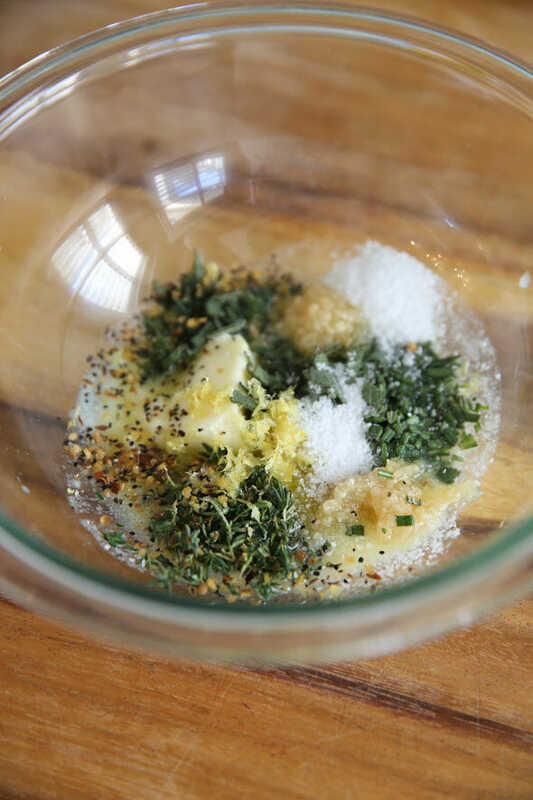 In a bowl, combine butter, olive oil, garlic, lemon zest, herbs, salt and pepper. Remove turkey from brine and pat dry with paper towels. 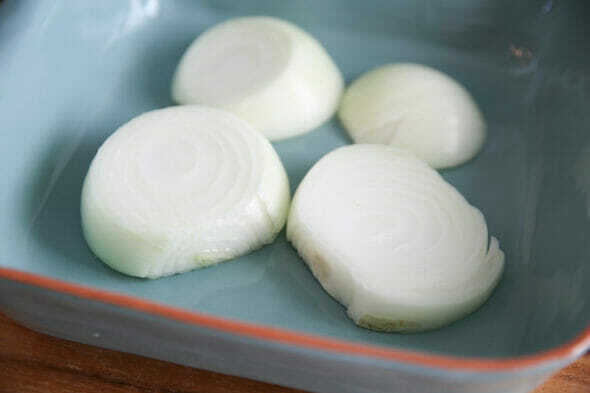 Place onions in baking dish that fits your turkey breast. If using potatoes, toss them in there as well. Place turkey breast on top of onions. Gently separate skin from turkey breast without tearing it off (the handle end of a spatula or wooden spoon often works well.) 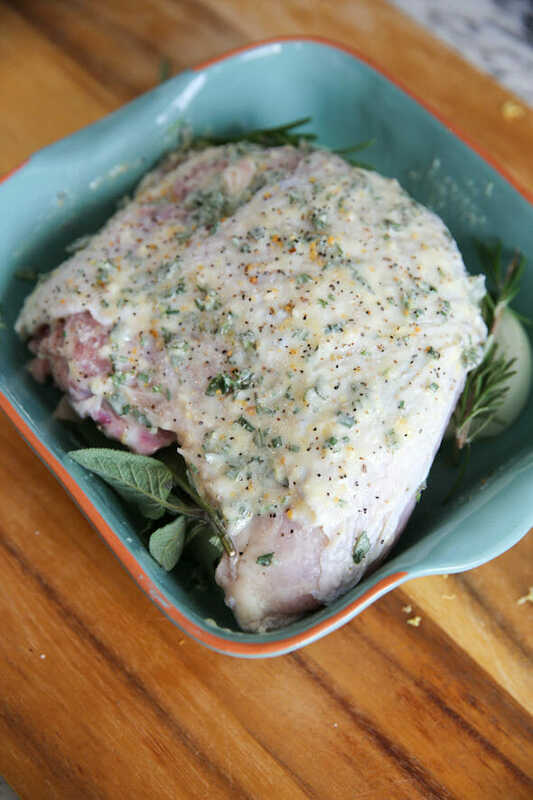 Spread the butter-herb mixture all over the turkey, especially stuffing it under the skin and spreading it all around. If you have extra whole herbs, just place them around the turkey. Place turkey in preheated oven for 10 minutes and then reduce temperature to 350 without opening oven door. Continue baking until internal temperature reaches 165 degrees. Baste turkey a couple of times toward the end of baking to achieve nice golden skin. (This means use a baster, or simply a spoon, so grab juices from the bottom of the pan and pour them over the top of the turkey.) Time will vary depending on size of turkey, generally a 3-ish pound breast will take 1-1.5 hours. Use a digital thermometer and remove turkey as soon as it reaches temperature so you don’t overcook. When done, remove pan from oven and tent with foil for 5-10 minutes to let juices redistribute. Carve meat off breast bone and then slice. Make sure to pick the meat off bones- it makes great sandwiches! If desired, drain off meat juices and make homemade gravy. You can also simply spoon the drippings over the carved meat. They are incredibly flavorful and make a great sauce on their own! Serving Amount: I like to plan on about 1 pound per person when purchasing meat. That doesn’t mean that every person will eat an entire pound of meat! That’s usually enough to yield a generous serving for each person. For example, a 3 pound breast will easily serve 3 people, plus some left over for sandwiches. You are wonderful. It funny how someone I’ve never met can be such a big part of so many of my family dinners. Thanks for all you do for me and my family. I can’t wait to make this. Happy Thanksgiving! Thank you Katie- Happy Thanksgiving to you, too! 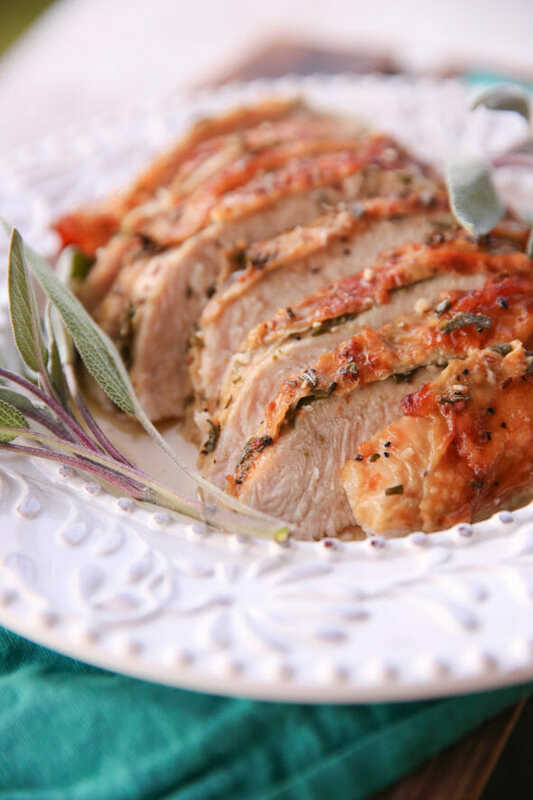 We love doing turkey breasts for thanksgiving because they’re easy for a small family! Your’s looks delicious! Haha. I love this because I am so afraid of the big bad bird! And gizzards. That’s the stuff that nightmares are made of. Thanks. And Happy Thanksgiving. Have you tried this with dried herbs? Always have those in my pantry. Less expensive. What do you think? You could, technically. The ratio of dry to fresh is 1 part dry to 3 parts fresh (so you’d want 1 teaspoon of each.) That being said, for this type of rub, I always use fresh herbs. This looks amazing!! Do you have a certain thermometer that you recommend for checking the meat? Sounds delicious. I will do a full turkey for Thanksgiving, but I love the idea of doing this for a Sunday dinner another time during the year. Thanks! I have always wondered about how salty turkey gets if you brine it. For taste and health reasons I avoid salt as much as possible. I would welcome your thoughts. Hi Celia. Studies have shown that only about 1% of the sodium from the brining solution is actually absorbed, so it doesn’t have much effect at all on the overall sodium levels. It also doesn’t make your meat taste much saltier. You can google this question and get lots of very scientific explanations, but I can just tell you from experience, it mostly helps with retaining moisture and producing more tender cuts of meat. Hope that helps! I LOVE turkey breast at Thanksgiving! Cooking the whole bird is never appealing to me, although I’ve done it almost every year because some people just expect it. I will definitely try this recipe! Thank you for all your great recipes and inspiration! Can this be done with a whole turkey breast? I was going to smoke it for Tday but this looks way yummier! Awesome! I live in the UK with my British husband and our two children, so Thanksgiving is always a small affair with only the 4 of us (including one husband who has no clue/appreciation for the holiday). Was just wondering what to make this year–sausages, a whole roast chicken, or beef? You may have just convinced me to go for a turkey crown!!! Do you cover the turkey breast with foil when baking? Thanks for all the great recipes! Totally understand what you’re saying, and yes- you could definitely use this rub! Hey Sara – Where did you get that turkey breast? I checked my local Kroger and they don’t have it. I want what you have. Can this be done with a whole turkey breast? Hello! How many people would you say 1 turkey breast would serve? Thanks!